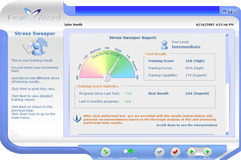 I used Stress Sweeper from Health Reviser for about 2 weeks when my doctor noticed a positive trend in my blood pressure. In 4 weeks I finally was able to get 180 points in Stress Sweeper and right after Omron showed me 123/75!!! Amazing work Health Reviser creators!! !